It is easy to know God's love in the mind, but for many it is difficult to believe it in the heart. This book is for those who want to feel the real love of God but can't. The author identifies the fundamental issues that stop a person from receiving and experiencing the love of God in all its fullness. Having ministered for over a decade at a deep level in people's lives, Ken shows how we can distort our image of Father God through our own false perceptions of Him. He passionately reaches out to those who have a broken father image and sets about to repair it. 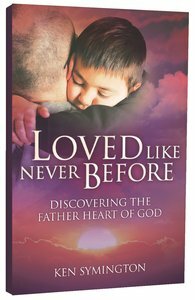 With a warm and conversational style the author powerfully demonstrates every individual's value to Father God and leaves the reader in no doubt just how loved and wanted we are. About "Loved Like Never Before!" It is easy to know God's love in the mind, but for many it is difficult to believe it in the heart. This book is for those who want to feel the real love of God but can't.The author identifies the fundamental issues that stop a person from receiving and experiencing the love of God in all its fullness. Having ministered for over a decade at a deep level in people's lives, Ken shows how we can distort our image of Father God through our own false perceptions of Him. He passionately reaches out to those who have a broken father image and sets about to repair it.With a warm and conversational style the author powerfully demonstrates every individual's value to Father God and leaves the reader in no doubt just how loved and wanted we are. Foreword, Introduction, Chapter 1 The Word Father Is Not Neutral, Chapter 2 My Own 'father' Story, Chapter 3 My Journey Begins, Chapter 4, Seeing The Father's Heart, Chapter 5 The Father's Wounded Heart, Chapter 6 The Angry Father, Chapter 7 The Suffering Father, Chapter 8 Does God Really Want To Be A Father To You? Chapter 9 Hindrances To Receiving The Father's Heart, Chapter 10 The Family Tree, Chapter 11 What Is A Dad? Chapter 12 Time To Come Home Chapter 13 What Now? Customer Reviews For "Loved Like Never Before!" Written in a very simple and readable style, this book can literally transform our understanding of who we are and what it means to call God 'Father'. Through his own walk through life, and in his own style of the storyteller - with humour and powerful truth, Ken Symington presents to us the Father we always longed for. I reckon everyone should read this book. It can transform your life. It has mine!